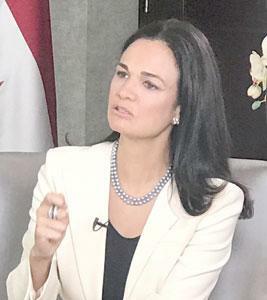 AMMAN — Vice President and Foreign Minister of Panama Isabel de Saint Malo de Alvarado said Panama is keen on increasing cooperation with Jordan and strongly believes that there is a huge room for cooperation with the Kingdom in several sectors. Panama identified Jordan as one of the countries with which it is keen to strengthen ties as the two countries have many things in common and as Panama values Jordan’s role in this region and the world “as a mediator and a stabiliser and a country that promotes peace and understanding”, the vice president said in an interview with The Jordan Times and Al Rai. “We believe that there are many similarities between Jordan and Panama even though we are far away... We believe that there is a lot of space for further work together, and cooperation in political dialogue, commerce and exchange of expertise in science and technology,” de Saint Malo, who started a visit to Jordan last week, said. The vice president said Panama has extended an official invitation to the Jordanian government to send a delegation to Panama to explore the opportunities and the possibilities for commercial exchanges with Panama and also with Latin American and Caribbean countries through Panama. “We hope to host this delegation in the near future. It is an opportunity to look into potential cooperation in several sectors,” de Saint Malo, who has met with His Majesty King Abdullah and top officials during her visit, said. During a meeting with the vice president, the King expressed Jordan’s keenness to advance cooperation with Panama at the political, economic and tourism levels, noting the importance of the recent opening of Panama’s embassy in Amman. His Majesty stressed the need to reach just and lasting peace based on the two-state solution that leads to an independent Palestinian state along the June 4, 1967, lines with East Jerusalem as its capital. The importance of reaching a political solution in Syria that preserves its territorial integrity and the unity of its people was also stressed. The top Panama official said the visit will also shed light on the free economic zones in Panama, which provide an opportunity for investors and business people to penetrate markets in Latin America and the Caribbean. Referring to a memorandum of understanding signed during her visit between Jordan and Panama, she said it intends to explore possibilities and enhance exchanges in fields of science and technology and tourism. “We wish to strengthen attraction of tourists in both ways... There is an expertise that can be exchanged in this regard... and with the establishment of our embassy here, we wish to invite Jordanians to visit Panama and explore the possibilities in our country,” the vice president said. In February, First Lady of Panama Lorena Castillo García officially inaugurated the Panamanian embassy in Amman. On Mideast peace, she said that Panama’s position on the Palestinian-Israeli conflict has been one that promotes the two-state solution and peaceful settlement of the conflict based on the UN relevant resolutions. “We believe that dialogue is a key to solve the conflict,” she added. Cooperation in anti-terrorism and security is another arena for cooperation between Jordan and Panama, she said. “Panama is a country that does not in any way accept terrorism. We are very serious and determined in the fight against terrorism. We have established a dialogue with Jordan in terms of security and intelligence information as well. We are both committed to the fight against terrorism and we understand that we need to collaborate globally to effectively fight terrorism,” the vice president added. On her participation in the World Economic Forum, she said the event provides an opportunity not only to strengthen ties with Jordan but also with the Middle East and North African countries. “We believe that the development challenges faced by this region are similar to the development challenges faced by Panama,” the vice president added.